… With these three posters. I excitedly took them (thank you so much!!) and looked around my house for the best place to hang them up. I wasn’t sure how much the Bubbers King would like them, but I was amazed when he took to them right away! 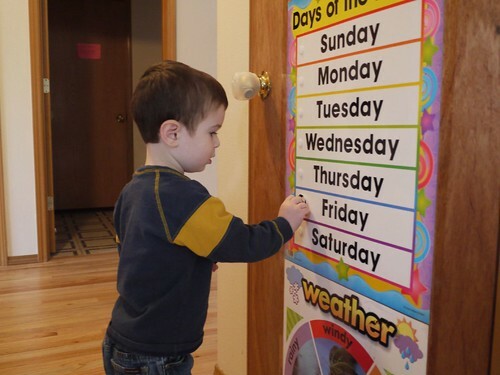 All on his own, he’ll ask me what day it is and I’ll tell him. Now he knows exactly when the garbage truck comes. And when we go to the grocery store or Costco. And when we go to church. 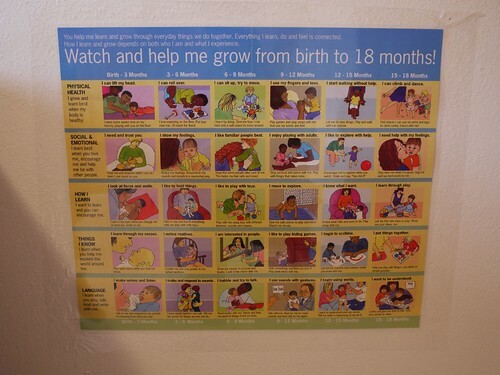 And thanks to this poster (that I altered a bit), I had a concrete aid for showing Bubbers when birthdays and holidays were. And boy, he just ate it all up! One night after Cub Scouts I went to Staples and saw these maps. And thought they’d be PERFECT! Then they called me back. “Sure!” I said and now they send me a draft of one of their letters each month and I make little notes on it and send it back. And I really enjoy being able to serve the parents in our state in this small way. And if you live in my state and have about five minutes to spare each month, they would LOVE to have you volunteer, too! Please ask me how and I’ll let you know! And then, just TODAY, I saw these great place mats at Walmart and found just the place for them next to our world map! Then one day it hit me! 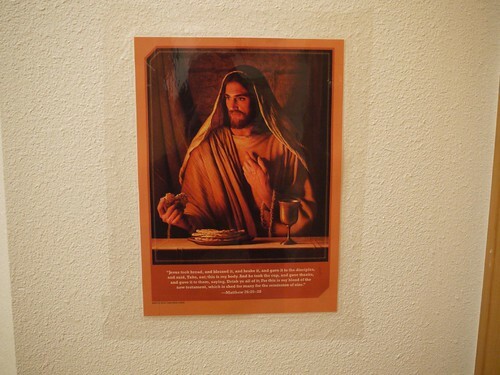 I should include spiritual posters, TOO! 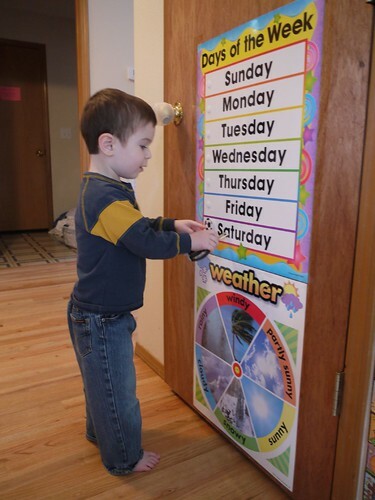 So over the last five months, I’ve been purchasing, laminating and mounting my favorite posters from ldscatalog.org. 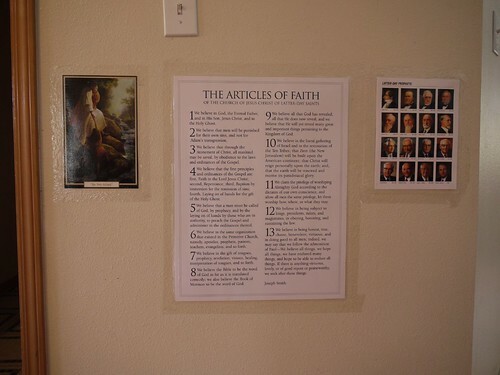 And I already had this Articles of Faith poster in the closet, so I got it out, laminated it and put it up! 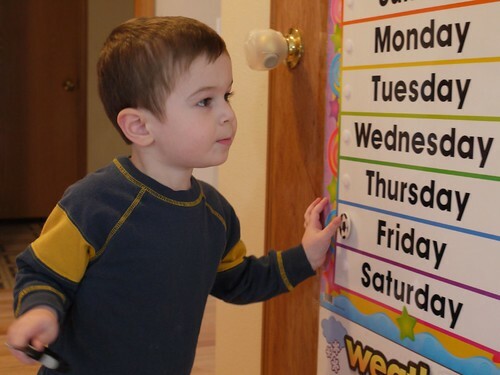 Now we’re teaching them to Bubbers for Family Home Evening each week and he always remembers which ones we’ve done and which one we’re going to do next! 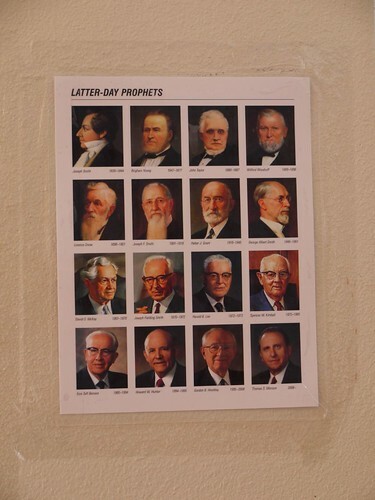 I thought the updated Latter-day Prophets poster would go well here, too. 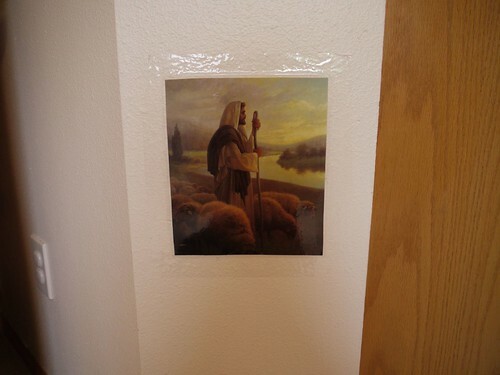 During this time, I decided I wanted my children to grow up surrounded by pictures of the Savior. 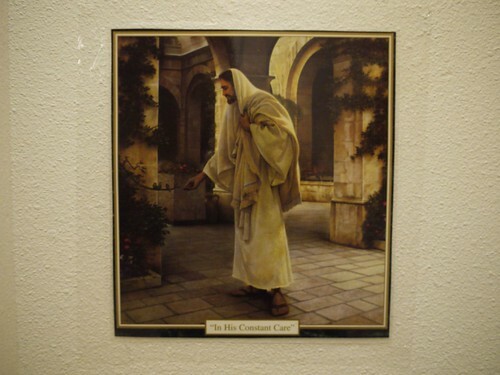 Beautiful images that would stay with them and shape how they felt about the Savior. So they would know He loves them. That He is their friend. And while thinking this over, I came across some pictures my mother had given me years ago! 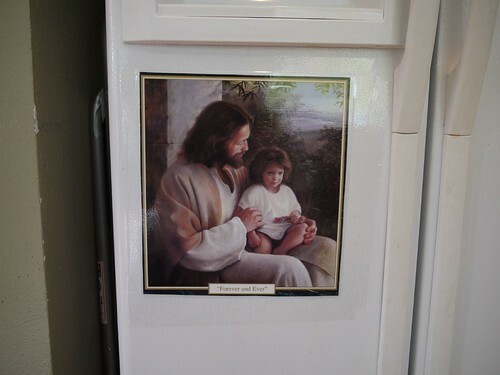 Beautiful Greg Olsen pictures from an old calendar she’d had. And put them on the fridge. 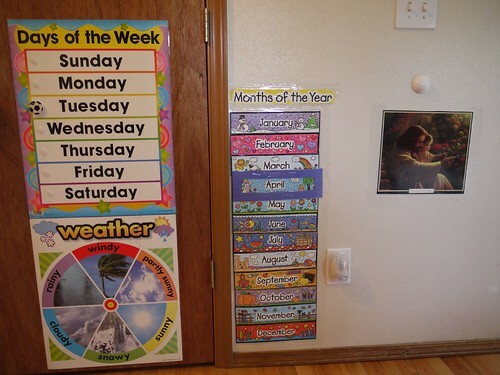 And right outside Bubbers’ room. And when I saw a picture in one of the months of The Friend that I liked, I cut it out and added it, too! 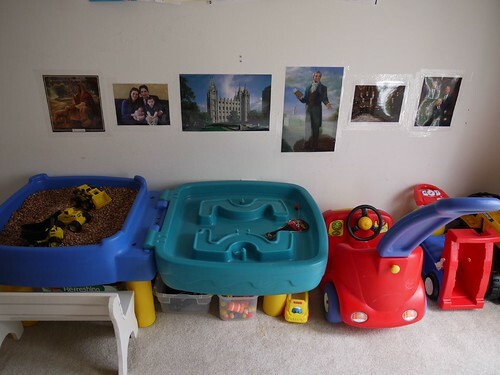 Then I realized the play room was an ideal place to mount some pictures. So I planned very carefully. 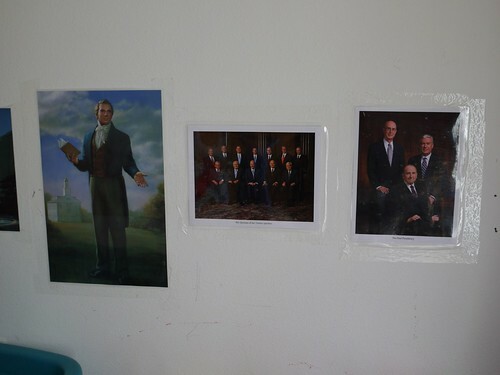 And decided to put Joseph Smith, the Quorum of the Twelve Apostles and The First Presidency up on one side. And the Savior, our family and the Salt Lake Temple where Charming and I were married and sealed on the other side. Because to me, this says it all. Why we’re here. Who we follow. What we’re trying to accomplish. The Gospel of Jesus Christ and my family are my life. They are why I do everything I do. And I want my little boys to know that. I want them to know without a shadow of a doubt that their Mommy knows this is true. 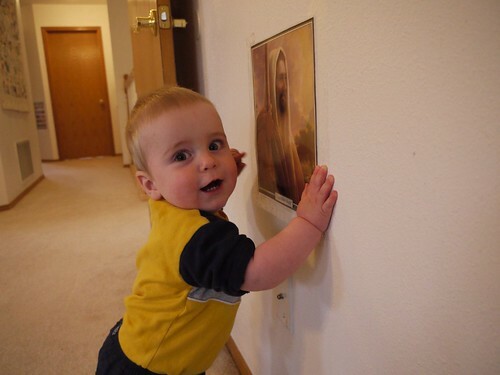 And I thrill to watch my little boy who is not even one, crawl excitedly across the room and pull himself up to get to the Savior. 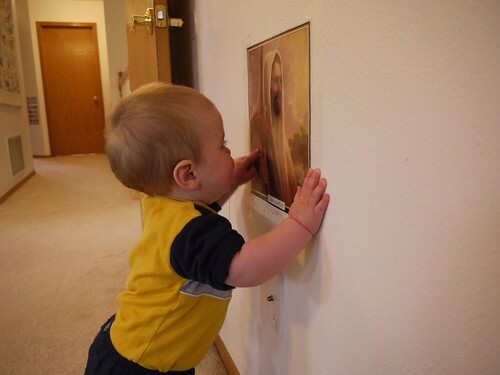 Because even a little baby knows the truth when he sees it. Heidi!!! You and I are on the same wavelength lately! How funny. 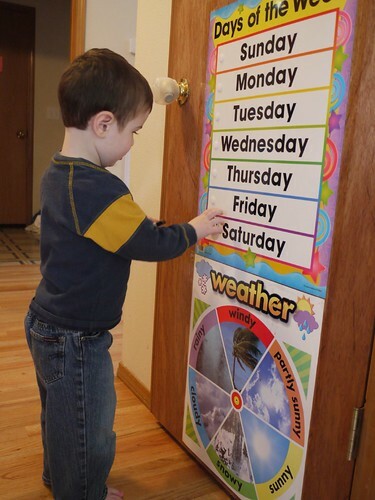 I just made some fun summer posters for the kids to change the day of the week and post the weather each day. And i just bought 50×32 maps of the world/u.s. states to hang upstairs. 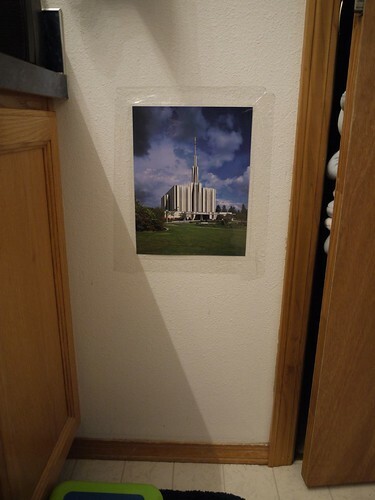 I had them laminated at byu and we are going to build a frame around them with molding. I’m so excited about the maps. 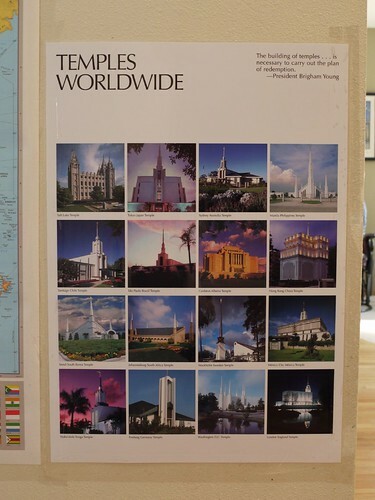 I got little dot stickers and keep thinking of a million things to use them for… marking all the temples. 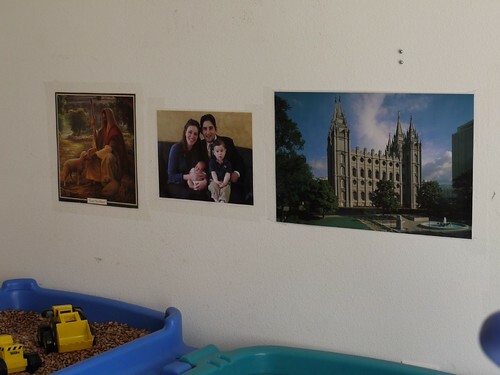 Put little pictures of family where they live… teach where things in history happened … first vision, where jesus lived… Love it all! Oh – and we are learning about a country every week this summer and the kids were so amazed to see the world map and learn about countries and see where everything is. So cool to see their minds enlightened with all that. Anyhoo… I just smiled when I read your post because it was so many of the same things I’ve been thinking of too. wow, I want a bunch of that stuff! 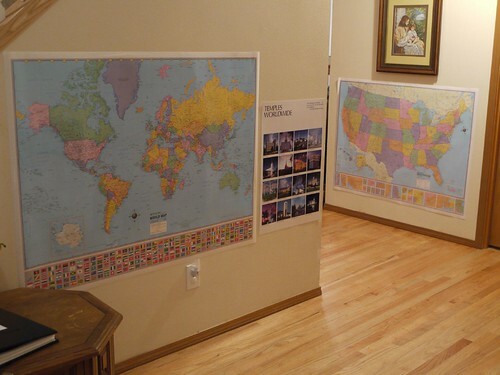 WE have a big world map on the wall in the kids room, because I loved maps as a kid. And now my kids love looking in the road atlas to see where we’re going whenever we have a trip planned. 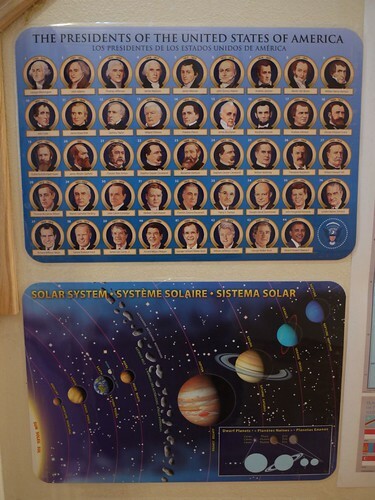 I would love to have a solar system display and a map of the USA too. 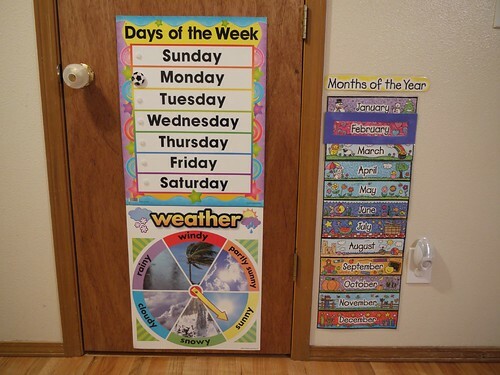 I always liked those little charts we got in your state too, I remember that one you showed. We don’t get those in Utah at all. That’s awesome you get to be on the board! 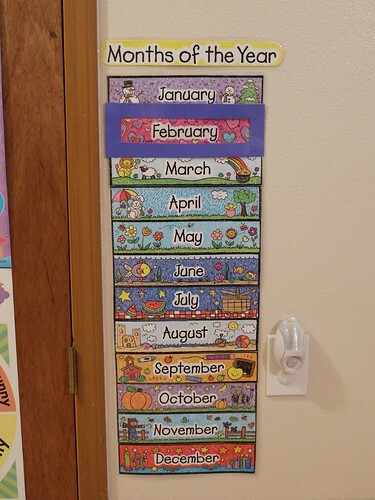 Wow, so many wonderful pictures and teaching tools adorn your walls! Wow! You’ve inspired me! I need to start thinking about getting more into teaching mode now that the summer is almost here!